We provide small removals and light haulage 2 men and a van services within Yorkshire and beyond.We have 2 men available and large vans so can shift larger loads. 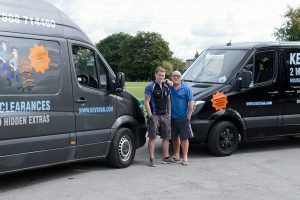 Our vans and drivers will collect from anywhere on the UK mainland back to Yorkshire. We are fully licensed and will legally dispose of your waste at a licensed tip. From a single item to a full house clearance we can provide you with a swift and professional service. We have an experienced team ready to deal efficiently and swiftly with your house clearance requirements.Our experience has taught us to be caring and effective when clearing houses as this can often be a difficult time for people and we make the process as painless as possible by being professional and responsive. Don't take chances with unlicensed rubbish removal firms, come and deal with the professionals at Kevs Van. We are fully licensed to deal with and dispose of your domestic rubbish. We can be a lot more cost effective than hiring a skip and we deal with the process from start to finish. Our team also frequently deal with property owners and property management companies who need a timely response and can often help at short notice. Contact us today for a quick quotation and fast response.